The team of Nordique recently discovered Danish home and furniture brand Noyer, and now we just can’t get enough. The brand was founded back in 2013 by carpenter and designer Janus Larsen, and it all started with a cutting board in a 35 square metre sized room in a cellar. Since then Nikolaj Hviid and Pelle Larsen has come onboard, and they’ve swapped their cellar room into a 250 square meter sized woodshop and their ever expanding product range now also includes more kitchen essentials, a dining table, side table, conference table, barstool, floor and table lamps and more. All made by hand in beautiful American walnut wood, not two products are the same. We’ve had the pleasure to have a quick chat to the guys! Please tell us a bit about the team. The team consists of Janus Larsen designer and carpenter, Nikolaj Hviid co-designer and joiner and Pelle Larsen journalist (brother of Janus). But we have been very good at making partnerships with a lot of talented people with expertise in other crafts such as photo, graphic design, sales, web design and much more. What’s the story behind Noyer? It all started when Janus designed furniture for his apartment and worked with a crossing of two 45 degree cuts. That made him see the very cool expression and then he started to sort of stretch the angles to see what effect that made. That was how the 8 angles were born and that is the foundation of Noyer. 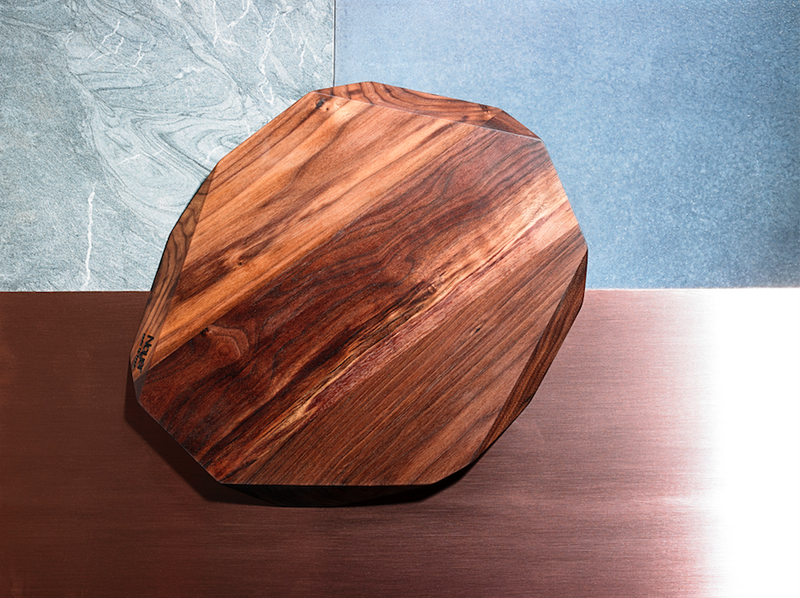 The design with the opposite angles in 45 degrees is the basis of the cutting boards, the tables and the knife magnets. Since then, the designs have been expanded and we are by no means limited to the 8 sides and opposite angles. How would you describe the brand? Playful, honest, you can sense the hands on approach - and it is important to us, respect for and understanding of natural materials and craftsmanship, a burning drive to challenge conventions. How does an average workweek for the Noyer team look like? That’s a tough question, as there are no normal days at Noyer. With the relatively small crew, we are faced with all sorts of different tasks that we have to learn as we go along. But we always make sure to have time to play and be around the materials and machines, so that we can use our creativity every day. We start at around 9:AM. Nikolaj and Janus spend most time designing and producing in the workshop, and Pelle and co spend time in front of the computer communicating with customers from the web shop, other stakeholders and on brand building. We strive to eat a really nice lunch all together. Most of the people of the team are into cooking so no dry and boring sandwiches at our lunch table. Twice a week we have “long days” and work until really late. We have a strong relationship on the team and we enjoy spending time together. Every once in a while we invite our family and friends to join us for lunch or dinner in the workshop. Noyer is a small community! As both Janus and Nikolaj have a background in the craft working with wood, the inspiration often comes when they are with the materials in front of the machines. Often it is about a certain technique to do something, as we are always very aware of how we would make the new product work in our production set up, as we have to be able to make a lot of them in a clever way. We make the products here in Copenhagen instead of having them made in countries with cheap labor. What has been the biggest challenge since launching Noyer? Another problem is to limit the new products. We have a list of 30 or more ideas for new products, but we could not build and launch them all in a hurry. Things like packaging is very important, and we have to have that in place before we launch a new product. But we have a lot of exciting prototypes in the woodshop. Where do you receive the majority of your sales from? Right now it comes from Scandinavia - but there’s many international request so we’re in the process of getting our web page translated to English. For our kitchen products it is mostly Scandinavia but a lot of our tables have been shipped elsewhere for example to China, France and the U.S.
Where would you love to see some of your work? That’s a hard one. But MoMa and Noma are two prestigious places. But there are a lot of places where we would love to see Noyer. Expanded (internationally) for sure - but still with a lot of focus on our “made by hand” pay off and on quality of course. We have learned, that it is very hard to predict where, who and what kind of interest we attract, so we kind of roll with it and try to take the opportunities that come along. But we are definitely looking into other markets than the Scandinavian ones. Sep 14 Skagenröra - a Swedish classic!